Our 25 team members are experienced in creating the design professional’s vision from schematics, into mockup production through fabrication, finishing and installation. We have been a proud member of the Architectural Woodworking Institute since 1987. Lyndan Inc. is a Quality Certified full service plant occupying a 20,000 sq ft shop and providing budgeting, mockup, production, finishing and installation. Currently in our 33rd year serving the west central Florida market with projects from $10,000 to $1,500,000. Our projects include custom furniture production, complex airline terminals, healthcare projects, patient room furniture and corporate work spaces and boardroom suites. 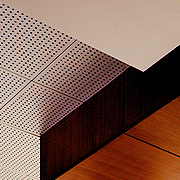 Our products include casework, fixtures, desks, architectural paneling, tellerlines, moulding, columns and fixtures. We have design professionals and product engineers on staff to enhance our ability to work with other design professionals, or to help design a project directly for an owner.